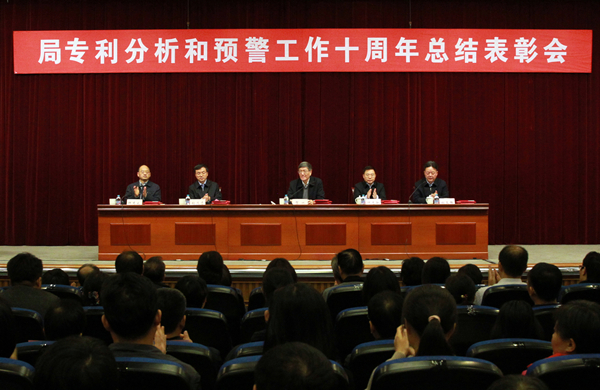 On December 3, the National Intellectual Property Administration of China (CNIPA) held the summary and commendation meeting for the 10th anniversary of patent analysis and early warning program. He Hua, Deputy Head of CNIPA attended the meeting and delivered remarks. The ten-year work by CNIPA on patent analysis and early-warning was fully summarized at the meeting, and the groups and individuals with outstanding performance were awarded as well, including awards of special contribution, excellent organizations, projects and teams. He Zhimin and Zhang Maoyu, Deputy Heads of CNIPA also attended the meeting.